Since 1982, Lutheran Services Florida (LSF) has provided refugee support to more than 200,000 families who fled religious and political persecution, among other types in oppressed countries. LSF helps newcomers from all regions of the world resettle in communities throughout Florida. Most refugees arrive with little more than the clothes they are wearing, but they bring with them the dream of a better life. The services provided by LSF resettlement staff give refugee families new hope and the opportunity to build a better future with freedom. With the support from LSF and the community, refugees move from being in the most difficult of situations to putting down roots and becoming integral members of our communities. A recently resettled family from Somalia is a prime example. 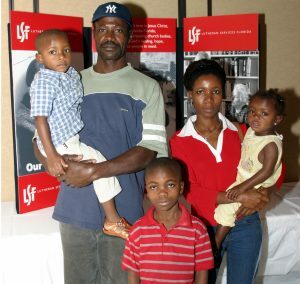 The family of 10 is part of the Bantu tribe, whose ancestors were brought to Somalia as slaves. This led to them being discriminated against during civil war in Somalia. Rebel forces raided their village, and raped and killed many women and children. The father was an English teacher in Somalia, and many of the rebel forces that raided his village frowned upon Western traditions such as learning English. So he was forced to end his English language program and flee with his family to a refugee camp. When the family finally arrived to the United States, LSF helped them with clothing, donated furniture, job placement, and school supplies for the younger children. The children now attend local elementary, middle, and high schools in the Tampa Bay area. Their father now works with LSF to help resettle more families from Somalia and the surrounding region. As demonstrated by the Somali family and thousands of other individuals, the ultimate goal of refugee resettlement services is to help newcomers achieve economic self-sufficiency as quickly as possible through a variety of services that enable them to find employment, provide for their families, and adapt to their new environment.